Teaching English online is a well-paid and rewarding profession. After earning my living teaching ESL online for the past couple of years, I wouldn’t go back to an academy. There are several good reasons for this. The first is convenience. In the online TEFL world, teachers teach from home meaning that you could potentially teach back-to-back classes all day if you have the stamina. The second positive is the freedom that comes from working for yourself. When you teach ESL online, you are your own boss. You know your worth and what you can provide, and on most platforms, you decide your own rates and who you wish to teach. Thirdly, and most importantly, are the students you meet online. Online students are professional people. They have opted to learn through internet classes because they don’t have time for an academy. They’ll listen when you speak and do their homework. Well, in truth, it’s because it’s not easy. On language teaching platforms, students have pages of English teachers to choose from. With mediocre or even adequate classes, students will come to you for just one or two lessons before moving on to another teacher. Good teachers, however, are always booked up. They can often set their own prices as well, meaning that popular online teachers are, for the most part, far better paid than academy teachers. But how do you stand out from the competition? The first thing a platform will ask you to do is to film an introduction video. Your intro video is your sales pitch to potential students about why they should choose you as their online English teacher. They are normally only one minute long. Potential students will view ten to fifteen videos before trying out a teacher and so a professional, engaging video is crucial to achieving that ‘sale’. You only have one minute to capture a student’s attention, so what do you say? Well, first of all let’s look at what not to say. 1# This may seem counter-intuitive, but don’t spend half the video talking about your qualifications and experience. Students want to know what you can do for them, not about your life history. Furthermore, qualifications do not prove that you’re a great teacher (the only way your student will know that for sure is by trying a class with you) they only prove that you have a lot of qualifications. 2# Don’t talk about yourself in general. Lines like ‘I like football’ or ‘I am passionate about travelling’ should be removed. To be blunt, your students aren’t interested in your hobbies. They only care about what you can do for them. So now you know what to avoid, let’s move on to what you should say in your pitch. 1# Where you are from. Your accent matters and so you should always say where you’re from in the first line of your pitch. If you’re from a country with lots of accents (such as the UK) say that you’re from the nearest well-known city. 2# Mention your CELTA or other well-known TEFL qualification so people know that you’re qualified to teach English. Place any other qualifications in the description below. 3# Any other languages you speak or have experience in. 4# Your specialism. Some online teachers think that if they specialise in a particular part of English then they’ll reduce the amount of students who’ll sign up for classes. In fact the opposite is true. If you market yourself to everyone, you market yourself to no one and you’ll attract fewer students. 5# Specialisms are important. They distinguish you from the crowd and justify a higher price for your work. So, if you’re particularly good at teaching higher-levels, lower-levels, teens, the IELTS exam, the Cambridge exams or Japanese speakers then be sure to mention this in the first half of your pitch. 6# What you can do for your students. This is the most important part that so many online ESL teachers fail to mention. The reason a student has clicked onto your profile is that they want to know how you can help them improve their English. So what do you have to offer? Are you very good at correcting mistakes? Do you know how to teach English to people who speak their language? Can you unlock the mysteries of high-level grammar for them? Or will you patiently correct them as they embark on this new language that they have never studied before? To illustrate what I mean, here is a sample pitch. I don’t recommend that you copy it word for word but rather use it as inspiration for your own speech. You’ll notice the second part of the pitch is all about what the teacher can do for their students. “Hi there my name is [insert name] and I am a CELTA qualified English teacher from Michigan USA. I have taught English in academies and businesses in Italy for the past 6 years and I speak fluent Italian. I specialise in higher-level students; from intermediate to advanced level. I do this because I am passionate about grammar and the fine details of the English language. And so, if you’re looking for a teacher to help you perfect your English who will a) correct your mistakes every time, b) tell you exactly why you’re making these mistakes and c) practice with them until you eliminate them forever, then I am the perfect teacher for you. Now you know how to create a great pitch, what equipment do you need to teach online? Apart from a computer, you’ll need a good webcam (external ones are normally better than the webcam that comes with your laptop), headphones with a microphone and a fast internet connection. If you are not teaching English on a platform you must choose a communication program which has a shared screen feature whereby you can show your computer screen to the student. You’ll need this feature when sharing pictures to teach vocabulary. Free programs that offer this service include Skype and Google Hangouts. The warm up activities that you use to start classroom-based lessons don’t work online. The reason for this is that they are too complicated. At the beginning of a class, your student might have connection problems or they may not have tuned their ear into your accent yet. For this reason it is best to ease your student into a class by asking an interesting question to which they can give a detailed answer. 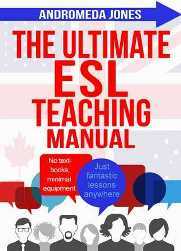 For a full list of questions check out our book The Ultimate Teaching ESL Online Manual. Whenever I have used visual materials in an online lesson, students have always been impressed. This leads me to believe that few online teachers use them, which I really don’t understand. All teaching platforms have a shared screen facility where the teacher can show their students pictures from their computers. A good library of visual materials will enable you to teach vocabulary that wouldn’t be clear without a visual reference such as movements, landscapes and emotions. They also enable you to teach difficult language points such as prepositions of place (‘above’, ‘under’, ‘next to’ and so on) which would be impossible without a reference picture. As so few online teachers seem to take up this opportunity, by using visual materials, you will also distinguish yourself from the competition. 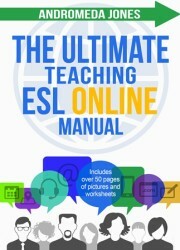 For this reason, our dedicated book, The Ultimate ESL Teaching Manual Online, provides over 25 pages of pictures which you can use for hundreds of activities. Other materials can of course be found on the internet and I encourage you to build up your own picture library. You can’t use textbooks in an online class and so you need a way to teach all grammar and vocabulary points without them. The best way to do this is through oral drills and speaking activities. 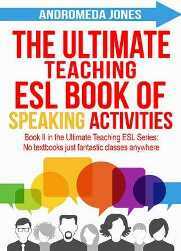 For more on oral drills, check out our teaching books The Ultimate ESL Teaching Manual and The Ultimate ESL Teaching Manual Online.